Smash Ace · 28 · From EmuKiller?! More like... FREEmuKiller!!!!!! Gonna ***** some more about teleport. The lag specifically. Mind talking to frozen on reducing it to anywhere from 7-12? 15 is abit much. It's pretty disgusting to use and it cuts down platform options a ton. Not to mention the way to get that cut down the lag is ridiculously precise. Even on auto-cancels its pretty slow. Talk to the boy. 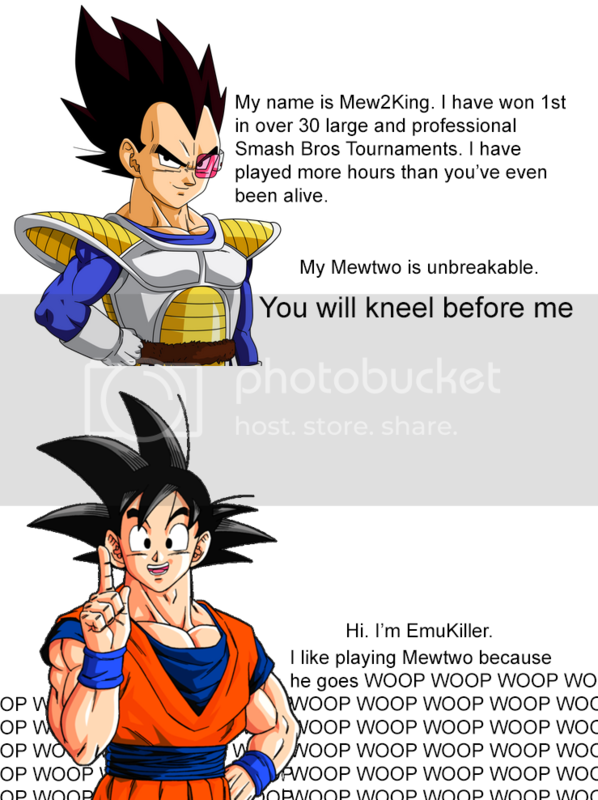 I'd like to see you use more Mewtwo in Melee. Hell, I'd like to see you play more Melee in general. One of the funnest melee smashers to watch, honestly. Your mind games are god like. More melee ~ less Project M.
PS - If you don't mind me asking, how many years have you been playing Melee/PM? Thanks! Melee Mewtwo is hard I'd definitely have to put time in to figure out how to stay safe. I'm focusing on Melee to be prepared for EVO though! I know about the 3.5 ledgestall. I used to to it that way in 3.02 before I picked up on the more efficient way lol. there's still an invincible ledge stall, just a lot harder/slower. Mewtwo definitely requires a lot more tech skill now! Congrats on becoming part of the Dev Team. Now make sure Mewtwo doesn't get nerfed too hard. I still want my ledgecancel/autocancel gimmicks to be there lolol. oh wow when did you get on the PMBR? From winning my netplay tournament to winning SKTAR 3! Good job dude! Congratulations at SKTAR 3! PM world champion? I was one of your ~10 fans day one, good to know that everyone made the "woop woop" chant a thing at grand finals on Day 2. You said you'd beat Armada, and you did way more. You're the man, see you at Hitbox for some free money! Ooo thats far X_X Whatever though, add me on FB Sam Kelson, I'll hit you up if I'm ever in your area. Everyone gets them for every 10 infractions they receive. Yea I have some room it's $5 a person. And do you have a way home or are you coming back with us? Intensity is less important that duration. What kinda shape are you in? I'm not going to be there Saturday and I have a teammate for Sunday. Sorry :(. Do you know anything about the Rowan, La Salle, U-Penn tourney thing? Two Seasons?!! That's totally Rhombus! lol do eet! XD I wanna meet this dood. LMAO! Holy crap. That's fuggin' hilarious. flkdjafkljsak;fsj you can tell him I'm a white blonde girl who plays Peach. I wonder how fast he'll be emasculated. yeah freaking Brawl and its lack of hitstun. I tell people "when Sakurai gives you shallow gameplay, you go back to N64! Sometimes I do this combo with Kirby. It's like Bair->Get hit by my opponent. It's pretty good, my opponents usually don't see it coming. UTD/Dojo beat M2K/Fiction to move to the winners finals. UTD/Dojo are in the winners right now with Ally/Sean.